Amma’s program dates and her visits to cities around the world. Amma will be giving Darshan in Amritapuri only on Mar 27th, 28th and 31; April 3rd, 4th and 6th. Amma will be giving darshan in Amritapuri in the month of May only in these dates.. 15,16, 18, 19, 22, 23, 25 & 26th. Afterwards, Amma will start her USA Yatra For details click here. Amma has come to symbolize spiritualism, philanthropy, service to the poor and the art of giving. I want to share with you what I have learned from Amritapuri: Giving. That is the message I get from Amritapuri. Go on giving. You can give. It’s not only money. You can share knowledge. You can remove the pain. And you can even go to the person who is suffering. Every one of us — the rich and poor — can give. There is no greater message than Amma’s giving to all the people of this region, and Kerala, and India, and to the world. There are things, that you cannot… The hug was heartfelt and warm. Her humanitarian work is incredibly extensive. Amma’s approach is to totally remove the suffering of the people. Amma’s mission is to comfort and uplift humanity by developing and upgrading their skills. Amma does fantastic work for communal harmony. She does great service to human beings, without any difference of class, creed, religion or nationality. I was really moved by Her work. I was overcome by emotions when I met Her. I was moved! She is wonderful! Mata Amritanandamayi is the cultural ambassador of India. We love Amma not because of who She is, but because of who we become in Her presence. There is no field of humanitarian activity where Amma’s ashram has not been involved. “This is from my own experience. Amma has a special power to sponge up one’s pains. Her presence has brought values of love and compassion back to a strife-torn society..Till date, Amma has not uttered a single word that has hurt anybody. She has always been kind to everyone, even those who have hurt her. Amma is a very, very transparent personality. She is in the real sense a “mother.” And as a mother, she loves all of the universe. She blesses us all. She gives strength to the individual, to the system and to the spiritual. That is how I feel! The foreign philanthropists and devotees, they are giving every year, more than 4055 laks of rupees ($8.6 million, US). to touch the substratum of society of this country. I have only come across only this math [M.A.M] which is touching the substratum of the society, providing houses and all other benefits for the destitute, women, and handicapped. Amma, you showed me the path. Governor of Rajasthan on 15 March 2004. Explaining to Amma how She was the inspiration behind his distribution of Rs. 250,000 each week to his state’s poor and suffering. At a time when security and peace issues dominate the international agenda, her actions and activities are a beacon of light and inspiration to Australians and people all over the world. Her hug has a wonderful power… Amma’s teachings can be put into practice in every country, and with her hug She brings consolation to many people..
We are fortunate enough to live in a century when a divine personality like Amma is moving about in the globe. Divinity is manifested in the person of Amma. The Indian concept of Jagadamba [Mother of the world]—this is what Amma embodies. While the governments lag behind in providing these facilities, Amma has worked wonders. Amma’s service to the entire humanity is fast-expanding, and it is wholehearted and selfless. She expects nothing in return. Divinity Herself has come to help humanity. She is a great person. She has done tremendous work for the poor and downtrodden, which most Mahatmas do not do. Most are going for big people. Amma is going for small people, the common people. This is a great thing. She is effecting jobs, effecting education—this is God’s work. I regard Amritavarsham50 [Amma’s 50th Birthday Celebrations] as something unprecedented, as people from 191 UN countries have come together. 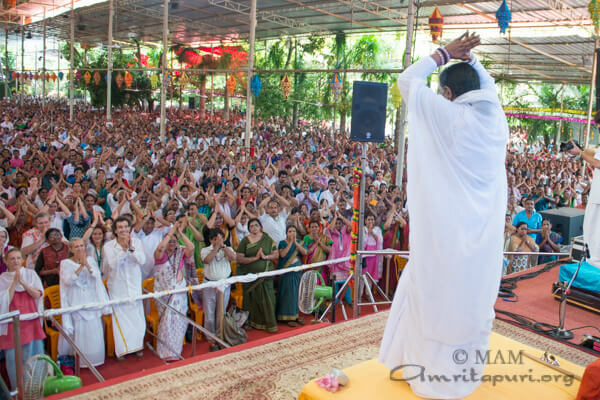 While agriculture energizes, industry enriches and knowledge enlightens, spirituality personified in Amma elevates us. Actually, your real darshan of Amma will come when the mother in your house is happy, and your sister and daughter are smiling and secure. When Amma holds you close to her heart, she is awakening the motherhood and fatherhood within you. Amma, through the medium of seva, has sparked a process of spiritual awakening. Amma has taught us the religion that teaches us to look at a needy person not with sympathy but with compassion. Amma has brought the lineage great rishis to us today. The greatest miracle that takes place in Amma’s presence occurs in the hearts of those who come to her. Amma has inspired many humanitarian activities that have drawn the attention of the world community. Now, therefore, I, Mayor Jim L. Fausett, proclaim July 2nd and 3rd 2008 to be the ‘Days of Amma the Hugging Saint’ in the city of Coralville. Amma, your message has touched us all. I hope that you will continue to come back to us here in Canada, and thank you again for giving so tremendously much to us. Amma has dedicated her life in helping others, Amma is living proof that equality and the belief that people should not be discriminated against due to their gender, race or cast is a universal one. Amma understands that we all need to find ways of respecting human dignity in each and every one of us. What a great privilege and a great honour to join in welcoming such an incredible force of good in a world that is troubled to Michigan. We look to our leaders like Amma to find courage and introspection and we thank her for her great leadership and for being here. I count myself fortunate enough to be one among many millions of Ma’s devotees. Your benevolence and magnanimity is universal, which transcends all geographical and man-made barriers, serving entire humanity with all-embracing compassion. Hence, may I, most respectfully, request your divine intervention and merciful blessings to cleanse my motherland of this horrendous scourge of violence, thereby ushering an era of everlasting peace and prosperity. It has been indeed a great privilege for my wife and myself to have had the darshan of Amma. I am sure that our lives will be enhanced. Her presence will help us in following her teachings and her example. Amma’s vision is to do everything that is possible to alleviate suffering. The embrace is something that she does physically and spiritually, but all the kind of help she has offered to people around the planet is an embrace of its own sort. Her embrace is about love, but it is also about taking that love and sharing it in a practical manner. Amma has done more work than many governments have ever done for their people… her contribution is enormous. Amritapuri on 3rd January 2012. Amma is the greatest entrepreneur of us all. She is so full of ideas and unique visions that she makes research easy. I’m going to take this concept of love and compassion to the next level at HP [Hewlett-Packard]. This is an excellent model of how you really make a productive enterprise. I think we can apply that in a special way. There is no end to Her perfection. Amma gives unconditional love, unlimited love, to anybody that she meets. Question: How do you reconcile the Church’s doctrine that Jesus Christ was the only son of God in the face of someone like Amma? Answer: Doctrine must take a back seat. God chooses many ways to manifest His grace in the world. As King Bhagirath flowed Ganga in the land of Bharata, our Mother, Mata Amritanandamayi Devi, is flowing the Ganges of Love over the entire world. For this, I offer my special gratitude to Amma. I feel very happy when I look at the service Amma is rendering to the world. She sees the vision of the Lord not only in all of humankind, but even in animals. Watching the service that Mata Amritanandamayi is rendering for the welfare of the entire world – today’s society that is blemished with selfishness – one sees She is flowing the nectar of love and reviving the entire society. Amma is the Incarnation of the Lord. She is the Avatar of Devi. To give amrita [nectar] to the devas [demigods], the Lord took the Mohini Avatar. But now, Mata Amritanandamayi – not only for the devas but for the entire humankind, for the entire animal world – She is the giver of amrita. I offer my salutations to Her. Under Her guidance, let peace and harmony be established in this world. There are flowers for incense, flowers for use in worship and flowers for medicine… but this flower is chosen by God. I thank Amma for giving me the direct experience of the Divine Mother. It has been 13 blissful years; this year I celebrated my bat mitzvah with Amma. One Mata Amritanandamayi can bring about the integration of the people of the world in a deeper sense than any number of organizations like the U.N.O. Love is the greatest conqueror. I believe, hugely influence the future world. Amma, your embrace has become a worldwide treasure sought by princes and peasants, women and men, babies and frail elderly. Your embrace is not just to comfort the suffering, but is a gift of strength and spiritual energy to all who work to embrace the world, the world of work, the world of government, and the world of family. All religions should work together for peace. Amma is a voice for all of us. She is certainly inspired by God and sent by God to guide us on this path. She is doing great work. She can only come from God. She is spiritually empowered, this spirituality of brotherhood. We all feel inspired by Her, and we thank God that He sent this gift to humanity! This servant of the holy Master Gurudeva Swami Sivananda sends his “sashtanga dandavat namsakarams” to your revered self through this letter. May you live long to bless all sincere seeking souls and enrich their lives with the wealth of “bhakti”!. From a letter sent by Swami Chidananda to Amma in July 1995. We see in the living hug that Mata extends to Her devotees, the principle of Advaita [philosophy of non-dualism] expounded by Shankaracharya. In a hug, two bodies come into contact with each other. Similarly, when the jivatman [individual soul] unifies with Paramatman [the One Supreme Soul], an immortal bliss – that is, amritananda – is established. This is Advaita. We believe that the Advaita preached by Shankaracharya is reflected in the hug by Mata Amritanandamayi. Amma is a blessing given by the Lord to his world. I thought that for me at the age of 90, everything was over. But meeting you has given me new experiences and a look into the future. And I am very happy. In front of Amma, I always feel like a child and she is the Mother of the world. Amma is a gift of God. God is love. Wherever there is love, God is there. What is real love? We come to understand it through Amma’s different seva activities. God has blessed Amma with the ability to understand human need and render appropriate help accordingly. As a result many other people are also inspired to join in the humanitarian efforts. All praise to God who has given us this blessing in the form of Amma. May Amma be a blessing to many more people. Amma teaches us that we should, at least, start with tolerance. But then we have to evolve on to respect, and from respect on to love. When we do that, all problems are solved. With Amma, I believe we can together create a world filled with real cooperation, love, truth and justice. Amma is the glory and light. Amma is compassion, light, consciousness and fullness. I offer my pranams to Amma.